I was aware of this song long before I heard it – as a young boy it was quoted at me by my Dad should I ever object to tidying my room. Since my room was rarely tidy, I became very familiar with the central notion of “No Charge”. Like my Dad, I can find immense amusement and pleasure in this style of song – talking country with a sentimental edge – but this is far from a great example. You might think, at first, that the style stands or falls on the strength of its concepts: not so. “No Charge” has a fine concept – mawkishness and moralising are assets here! – but where JJ Barrie falls down is on development and details. Once our young entrepreneur has presented his list, and been slapped down by Mom, the track has nowhere to go, and explores that nowhere thoroughly for two minutes. Contrast it with something like “Teddy Bear” by Red Sovine, where tears are ruthlessly jerked right up to the final words. Barrie, on the other hand, adds no new details and just repeats himself. 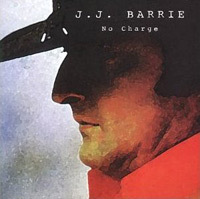 This is partly because “No Charge” is a cover version, and you can hear what I assume is the original melody being hollered in the background: it sounds rather as if it’s trying to escape. You were chuckling about that when I saw you last, Marcello — I wish I had seen it, the New Thing’s belated Bill Grundy moment! “Grumpy Old Men” bang on about how great things used to be, whereas I’m more concerned about how things are going to be. Hence vinyl fetishists etc. have more in common with GOM than I do”. Erm, Mr Child-Prodigy-Who-Went-To-Oxford, did they not teach you Logic amongst those dreaming spires? I done moral philosophy innit. I gave up quothing in 2003 on doctor’s orders. So you will quoth nevermore? Bravo, my little caramel wafer! I was a bit of an Ethics Girl myself at one time. Can I be a bit controversial and say I actually quite like this song? Maybe it’s bad for 1976 standards, but given some of the crap that’s been at number 1 in the 35 years since, I don’t think it’s as bad as people claim. Maybe because JJ Barrie seems like a genuinely nice person (having never heard of him before the recent TOTP repeats), a friendly uncle type, yeah it’s overly sentimental but it’s written at least with some heart. There are records much, much worse than this to have graced the top spot, I’ll listen to this over some dire manufactured boyband ballad/X Factor winner any day. It wasn’t even the worst record on tonight’s TOTP, that honour went to Our Kid. Wikipedia page reveals that Mr Barrie is still alive and well, and approaching his 78th birthday in a few weeks. He’s also an ex-comedian, so I wonder if he’d have appreciated the Billy Connolly parody. 2. Better than Our Kid??? I haven’t heard their sole hit in years but in my mind it sounds like a Spector-lite pre-pubescent smash. 3. No Charge better than most Westlife no.1s???? Err, yes, of course you’re right. 1. Yup, watch on the iplayer! Bye bye JJ… never to be seen again after this week’s TOTP. Our Kid… memory playing tricks. Wafer thin production. Mojo this month has an article advertised on the front cover about “Why Punk Had To Happen” written by Jon Savage. Not read it yet – bought it for a flight later on this month (it came complete with Suze Rotolo’s book on Bob Dylan, which I imagine will help kill the time too). I wonder whether he’s bothered reading this epic thread to get some ideas. Ha! I’d like to think so. But sadly it’s mojo selling the mag with their usual exclamation mark-ridden front page. The piece has little to do with “why”. No mention of JJ Barrie. Or Third World War for that matter. …which I’d never heard til just now. The song’s lousy but Cloughie’s spoken part is really quite touching. “Why Punk Had To Happen” – so that ageing hacks could earn a crust writing articles about it 36 years later. what was on the ‘B’ side of no charge? looking for a song called love is all around from the mid to late 70s, so not the wet wet wet version. # 376 that song was originally recorded by the Troggs in the 60s and it’s been covered many times, so no doubt a few artists did it in the 70s. Or do you mean a different song? Can’t believe this bloke’s got another film adaptation in the works. Peter Pan wasn’t even that good a book! That joke might be cast adrift from the best, but it never gets old.